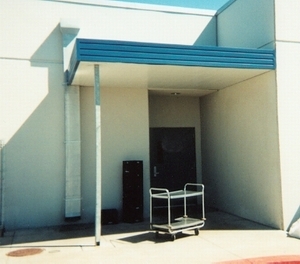 Project: Elementary School - Midlothian, TX. Project: HJM Elementary School - Port Lavaca, TX. This is the premium choice for single slope walkway canopies. Features flush soffit, box gutter, drain-thru columns and a low roof slope of 1/4" on 12". The hot dipped galvanized framing is completely enclosed and out of sight. Columns are usually spaced out between 10'-0" to 15'-0" which are referred to as bays. Furthermore, this model can be architecturally designed with your choice of Childers ROOF TRIMS.